This long range radar antenna (approximately 40m (130ft) in diameter) rotates on a track to observe activities near the horizon. RADAR is an acronym for RAdio Detection And Ranging or Radio Angle Detection And Ranging. It is a system used to detect, range (determine the distance of), and map objects such as aircraft and rain. Strong radio waves are transmitted, and a receiver listens for any echoes. By analysing the reflected signal, the reflector can be located, and sometimes identified. Although the amount of signal returned is tiny, radio signals can easily be detected and amplified. Electromagnetic waves reflect from any large change in the dielectric or diamagnetic constants. This means that a solid object in air or vacuum, or other significant changes in atomic density between object and what's surrounding it, will usually reflect radar waves. This is particularly true of electrically-conductive materials such as metal, making radar particularly well suited to the detection of aircraft and ships. Radar waves reflect in a variety of ways depending on the size of the radio wave and the shape of the target. If the radio wave is much shorter than the reflector's size, the wave will bounce off in a way similar to the way light bounces from a mirror. Early radars used very long wavelengths that were larger than the targets and received a vague signal, whereas modern systems use shorter wavelengths (a few centimetres) that can image objects as small as a loaf of bread. Radio waves always reflect from curves and corners, in a way similar to glint from a rounded piece of glass. The most reflective targets have 90Â° angles between the reflective surfaces. A surface consisting of three flat surfaces meeting at a single corner, like the corner on a block, will always reflect directly back at the source. These so-called corner cubes are commonly used as radar reflectors to make otherwise difficult-to-detect objects easier to detect, and are often found on boats in order to improve their detection in a rescue situation. For generally the same reasons objects attempting to avoid detection will angle their surfaces in a way to eliminate corners, which leads to "odd" looking stealth aircraft. Brightness can indicate reflectivity as in this 1960 weather radar image. The radar's frequency, polarization, and receiver determine what it can observe. The easiest way to measure the range of an object is to broadcast a short pulse of radio signal, and then time how long it takes for the reflection to return. The distance is one-half the product of round trip time (because the signal has to travel to the target and then back to the receiver) and the speed of the signal. where c is the speed of light in a vacuum, and Ï„ is the round trip time. For RADAR the speed of signal is the speed of light, making the round trip times very short for terrestrial ranging. For this reason accurate distance measurement was difficult until the introduction of high performance electronics, with older systems being accurate to perhaps a few percent. The receiver cannot detect the return while the signal is being sent out â€“ there's no way to tell if the signal it hears is the original or the return. This means that a radar has a distinct minimum range, which is the length of the pulse divided by the speed of light, divided by two. In order to detect closer targets you have to use a shorter pulse length. These two effects tend to be at odds with each other, and it is not easy to combine both good short range and good long range in a single radar. This is because the short pulses needed for a good minimum range broadcast have less total energy, making the returns much smaller and the target harder to detect. You could offset this by using more pulses, but this would shorten the maximum range again. So each radar uses a particular type of signal. Long range radars tend to use long pulses with long delays between them, and short range radars use smaller pulses with less time between them. This pattern of pulses and pauses is known as the Pulse Repetition Frequency (or PRF), and is one of the main ways to characterize a radar. As electronics have improved many radars now can change their PRF. However there is another effect that can be used to make much more accurate speed measurements, and do so almost instantly (no memory required), known as the Doppler effect. Practically every modern radar uses this principle in the pulse-doppler radar system. It is also possible to make a radar without any pulsing, known as a continuous-wave radar (CW radar), by sending out a very pure signal of a known frequency. Return signals from targets are shifted away from this base frequency via the Doppler effect enabling the calculation of the speed of the object relative to the radar. One serious limitation with this type of solution is that the broadcast is sent out in all directions, so the amount of energy in the direction being examined is subject to the inverse-square law. To get a reasonable amount of power on the "target", the broadcast should also be steered. 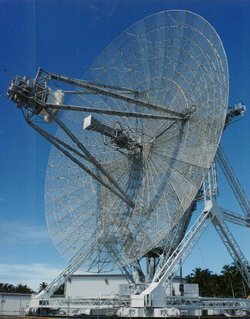 More modern systems used a steerable parabolic "dish" to create a tight broadcast beam, typically using the same dish as the receiver. Such systems often combined two radar frequencies in the same antenna in order to allow automatic steering, or radar lock. Not all radar antennas must rotate to scan the sky. Phased array radars require no physical movement. The beam can be steered by electronically adjusting the phase-shifters to each small antenna element. This means that the beam can scan at thousands of degrees per second, fast enough to irradiate many individual targets, and still run a wide-ranging search periodically. By simply turning some of the antennas on or off, the beam can be spread for searching, narrowed for tracking, or even split into two or more virtual radars. Phased array radars have been in use since the earliest years of radar use in World War II, but limitations of the electronics led to fairly poor accuracy. Phased array radars were originally used for missile defence. They are the heart of the ship-bourne Aegis combat system, and the Patriot Missile System, and are increasingly used in other areas because the lack of moving parts makes them more reliable, and sometimes permits a much larger effective antenna. As the price of electronics has fallen, phased array radars have become more and more common. 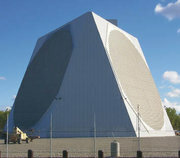 Almost all modern military radar systems are based on phased arrays, where the small additional cost is far offset by the improved reliability of a system with no moving parts. Traditional moving-antenna designs are now limited to roles where cost is the main factor such as weather radars and similar systems. X 8-12 GHz 2.5-3.75 cm missile guidance, marine radar, weather; in the USA the narrow range 10.525GHz Â±25MHz is used for airport radar. K 18-27 GHz 1.11-1.67 cm from German kurz, meaning 'short'; limited use due to absorption by water vapour, so Ku and Ka were used instead for surveillance. K-band is used for detecting clouds by meteorologists, and by police for detecting speeding motorists. K-band radar guns operate at 24.150 Â± 0.100 GHz. Ka 27-40 GHz 0.75-1.11 cm mapping, short range, airport surveillance; frequency just above K band (hence 'a') Photo radar, used to take pictures of license plates of cars running red lights, operates at 34.300 Â± 0.100 GHz. R.V. Jones, Most Secret War. R.V. Jones's account of his part in British Scientific Intelligence between 1939 and 1945, working to anticipate the German's radar, radio navigation and V1/V2 developments. USAF Long Range Radar, "84th Radar Evaluation Squadron". US Air Force Squadron responsible for long-range Radar Sensor (both civilian and military) operational availability, counterdrug, search and rescue, and flight safety information assurance to the operations community..